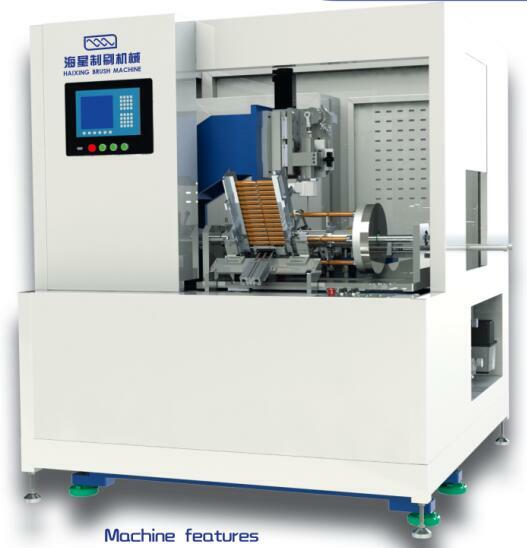 Automatic hair Brush Drilling And Tufting Machine. Hair Brush Making Machine HS40-16F is specially designed to produce round hair brushes. It has four rotary working stations, and has the functions of feeding brush handles, drilling holes and tufting filaments. The tufting speed is as high as 650 tufts/minute. And Trimming Tool can be installed as an optional device. * It has one drilling head and one tufting head. * It can produce brushes with two colors filaments. Looking for ideal Hair Brush Making Machine Manufacturer & supplier ? We have a wide selection at great prices to help you get creative. All the Hair Brush Tufting Machine are quality guaranteed. We are China Origin Factory of Automatic Hair Brush Making Machine. If you have any question, please feel free to contact us.